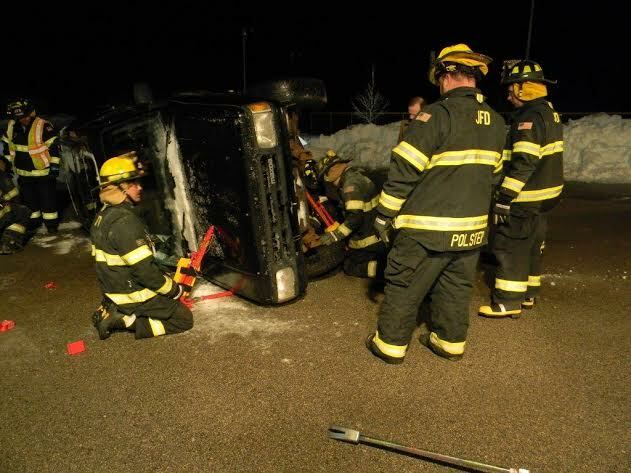 Jacksonport firefighters training in winter at a simulated auto accident. Jacksonport prides itself on its volunteer fire department. Its members are the truest of public servants. When their pagers sound, the men and women who provide fire protection and first-response medical aid race from jobs or homes to aid those in need. They train constantly, attend seminars, acquire new skills, maintain equipment, clear storm-fallen trees, pitch in for town celebrations and run their own fund-raising events. When Jacksonport firefighters answer a call the odds are they will be assisting someone they know — friends, relatives, former teachers. Emotional stress is part of the job. 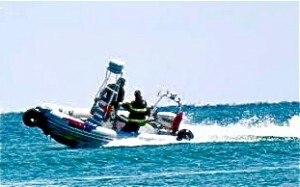 Jacksonport’s Sealegs amphibious rescue boat sprints across Lake Michigan. The fire department would like to extend our deepest appreciation to the support that our taxpayers give us year after year. In 2019 we will continue to work to improve the services we provide to the town. If you have any interest in joining the department please feel free to contact Chief Ash (920) 823-2488.